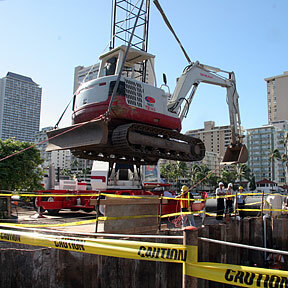 MICRO MACHINES: Workers lowered a small excavator Wednesday into a 44-foot-deep pit on the mauka side of the Ala Wai Canal. The pit is part of the construction of a microtunnel under the canal to replace a sewer main that ruptured in March. How bright is Hawaii's future?